I have an 8-year-old rescue dog named Jamal. He’s been eating a vegan diet for over 3 years now (minus all the non-vegan human food that he gets fed by family). Anytime people hear that my dog is vegan they get very worked up about it and some even say it’s a form of animal cruelty. Our veterinarian recommended that we put him on a vegetarian formula (which was still a vegan formula but it's just labelled vegetarian) without even knowing that we were vegan ourselves, so that was pretty cool! She said it would help with his arthritis. Also, I just want to quickly mention that in every single veterinarian's office and pet store I’ve been to, they sell a vegetarian formula there. Why would a vets office sell this food if it was bad for dogs? The people who say vegan diets are bad for dogs have done zero research on the subject, but I have. I love Jamal and I would never feed him vegan food if it was bad for him. For example, if I had a cat, I wouldn't make them vegan. Jamal eats the Natural Balance Vegetarian Dog Food and I buy it at Petland. (This isn't sponsored by the way, I just wanted to write an article about why dogs CAN be vegan and thrive). So many people tell me that dogs are carnivores and natural meat eaters. The thing is, dogs are so domesticated now. You can’t compare a beagle to a wolf. Dogs are metabolically omnivores. This means that they can get all of their nutritional needs from plants (without needing any supplements). In this blog post I’ll share the most common questions I get about vegan dogs and I’ll also debunk some of the most popular myths. This isn't related to health - but it’s of course immensely better for the environment! There are so many dogs who are allergic to animal proteins including chicken, eggs, dairy, beef, etc. Animal protein is actually the number one things dogs are allergic to according to researchers at the Cummings Veterinary Medical Center. By feeing your dog plant-based, you’re feeding them food that they aren’t as likely to have negative reactions to. Plant food is way easier to digest than meat. It can help dogs with constipation, loose stools, and gas. Plants aren’t acidifying like meat-based food is. Vegan food is gentle on the digestive system and anti-inflammatory. Due to its anti-inflammatory properties, vegan food helps to relieve joint pain. This is especially great for senior dogs, which sadly Jamal is considered as one. Vegan food gives them better mobility, stronger muscles, and higher endurance. Dogs can get every single nutrient they need from a plant-based diet. There are 10 essential amino acids that dogs need. Even though something like oats might not have all 10 essential amino acids, it can easily be combined with a food like peas, then the combination contains all 10. Figure 1. Complementary proteins (1) from oats and peas when combined provide all essential amino acids. Source. If someone is worried about dogs not being able to get protein on a vegan diet, they can. Every single plant has protein in it! Dogs need more protein than us, so their meals should be 1/3 or 1/2 protein. If you are buying a pre-made dog food like I do, this is already taken into consideration when they made the formula. You can make your own vegan dog food and there are resources online for this, but I honestly haven't looked into it too much. Right now, I just feel more comfortable buying dog food that has been specifically made for vegan dogs to ensure they get everything they need. There are two amino acids that you can find in meat but not in plants. These are taurine and L-carnitine. It is possible for dogs to make these amino acids themselves if they get lots of cysteine and methionine (other amino acids), but many dog food companies supplement these into the food to ensure that dogs won’t get deficiencies. I just checked the ingredients of the food I buy Jamal and both these ingredients (along with B-12) are included as a supplement! Dogs do requite a certain amount of fat in their diet, which dog food brands take into consideration. They can also get this fat/oil from tahini, flax seed oil, hemp seed oil, or ground flax seeds. You can even give them olive oil! Flax seed oil is especially good for them because it’s full of omegas and essential fatty acids. Isn't It Unnatural To Feed Dogs Vegan? I often hear that a vegan diet isn't natural for dogs. Is anything we do “natural” though? Is it really natural for a dog to be eating a cow? Is it natural for a dog to be sleeping in a bed? I mentioned earlier that dogs are not the same as wolves. This shows in their genetic appearance, but also in their digestive system. Dogs are easily able to digest starches, whereas wolves can’t. So to answer this question - nothing we do is natural, and it’s not natural for dogs to be eating heavily processed food full of animal segments that humans can’t eat coming from cows and pigs. Too often I hear about the “dangers” of feeing dogs vegan. I quickly want to talk about how terrible conventional dog food is for your dog’s health. The pet food industry isn't one that truly cares about the wellbeing of your companion animal - they want to make a profit off your pet. There are carcinogens in conventional dog food. And this obviously shows in the way that dogs get cancer and human diseases - because we are feeding them the same foods we eat that cause cancer in our bodies too. Commercial dog food contains something called 4-D meat. This is meat that is unfit for human consumption. The 4 “Ds” stand for disabled, diseased, dying, or dead. This meat is called “meat derivatives” or “meat byproducts” on the ingredients section. Dog food is made out of skin, tendons, intestines, brains, reproductive organs, tumors, literally everything you can imagine. Dog food is also made out of spoiled supermarket meat. Basically, anything that is going to be thrown out because humans can’t use, they put it in dog food. Sometimes the styrofoam isn't removed from the spoiled meat packaging, and sometimes ear tags from cows are ground up with the meat too. It’s pretty disgusting. Roadkill is also used for conventional dog food, and so are euthanized animals. I once had a presentation at school where I learned that even euthanized cats and dogs are put into cat and dog food… it’s an industry that truly does not care about the wellbeing of your animal. Especially if you’re buying the cheapest dog foods possible. Apparently, if the ingredients section just lists “meat” without clarifying what animal it comes from, that can be cats or dogs. The President of the pet food regulatory association admitted it himself. If you’ve read this far and you’re considering switching your dog to a vegan diet, that’s great! My purpose with this post isn't to persuade anyone. It’s just to provide you with facts and information so you can make an informed decision for yourself about what’s best for your dog. I recommend talking to your veterinarian and getting a blood test right before switching your dog to a vegan diet, and then also 1-3 months after switching their diet. This can provide you with peace of mind that they’re getting all of the necessary nutrients they need. I love this article from CNN which features six veterinarians agreeing that all of the nutritional requirements for dogs can be met with a vegan diet. There are lots of vegan dog food brands out there, you can research what’s in your area and what’s best for your dog. 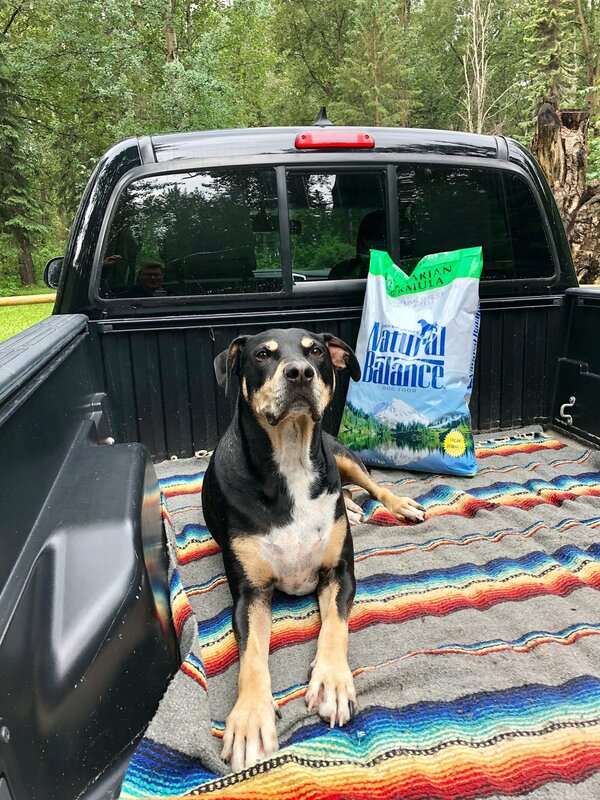 I live in Alberta, Canada, and the Natural Balance Vegetarian Formula is the most accessible and affordable for me to buy Jamal (he’s almost 90lbs). When you switch their food, don’t do it all at once. Slowly start to incorporate it with the food that they eat now. So if you normally feed your dog 3 cups of kibble a day, make it 2.5 cups of their normal kibble with 0.5 cups of the vegan kibble. Then transition them to being vegan over the course of 1-2 weeks until their food is 100% plant-based. Hopefully, you’ll visibly be able to see the difference in their health like I did with Jamal. His coat became way shinier, he has way more energy, and he has lots of endurance and can go for longer walks. Also, fun fact - one of the oldest dogs in the world is named Bramble, she lived to 28 and she ate a vegan diet! Jamal’s favourite treats - Whimzees! These are a bit expensive so we don’t buy them too often, but they are very healthy and really good for his dental health. VegetarianDogs.com - This website provides lots of information about feeding dogs. They also have a book called: Vegetarian Dogs: Toward a World Without Exploitation. This book includes dog food recipes, information about nutrition, supplements, and more. White paper on feeding dogs a plant-based diet by Dr. Adolphe - I have a PDF so please email me emilymiddin@icloud.com if you want it! Peer Reviewed Studies About Vegan Dogs - This article features a summary of 3 scientific studies on how a vegan diet affects dogs. 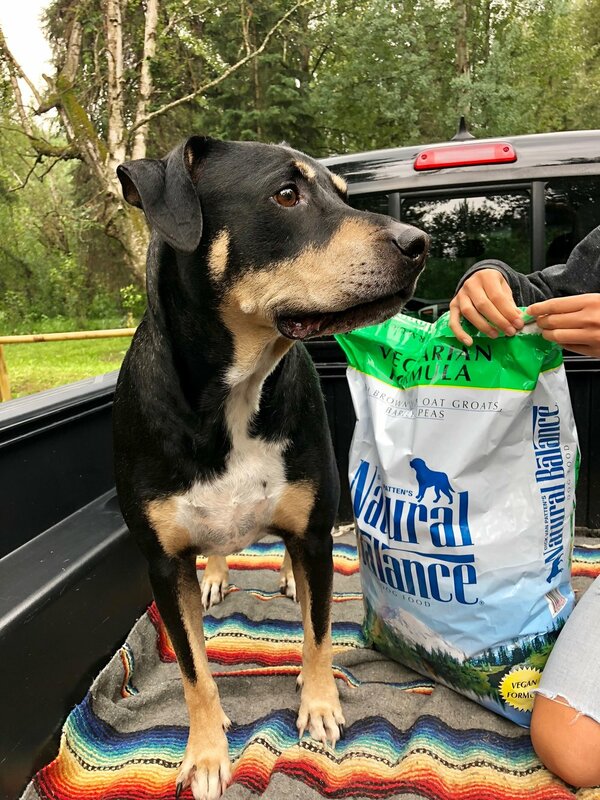 Good Nutrition For Healthy Vegan Dogs - This is a very informative article and at the end, it features a very long list of vegan dog food brands, supplements, and vegan dog treats from all over the world. The list includes 100% vegan pet food companies, but also non-vegan companies (like the one I use, Natural Balance) that offers a vegan option. I am not a doctor. I am not a veterinarian. I did co-op at a vet’s office for 6 months but I'm not qualified in anything. I’ve just done plenty of my own research to come to an informed decision about what the healthiest diet for my dog is, and that’s a plant-based diet.